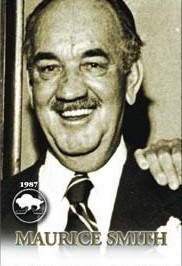 Born in London, England, Maurice Smith was Sports Editor of the Winnipeg Free Press from 1944-1976 and a most ardent supporter of hockey. He was the first President of the Manitoba Sportswriters and Sportscasters Association and served on the Manitoba Sports Hall of Fame Selection Committee in the early 1980's. Maurice Smith was also named to the MSSA Media Roll of Honour.